Along the breathtaking, world class scenic Sea to Sky Highway (99) there are many distractions – velvety snow capped mountains dropping into Howe Sound, waterfalls cascading down glistening granite cliffs and beautiful emerald colored Howe Sound itself. After traveling forty five minutes from Vancouver you pass through Squamish, with three award winning breweries. Tempting as it may be to stop here, there is so much more ahead. Just 40 minutes away at Function Junction, two amazing craft breweries await you, with one more in Whistler proper. Very soon there will be a compelling reason for the craft beer wander to keep going beyond. Known mostly as a potato farming community, things in the lush green Pemberton Valley are about to dramatically change. Sitting 1600 ft lower than Whistler with a temperate climate – it has a very attractive comfortable environment year round. Mountains rise straight out of the valley floor on both sides, with Mount Currie’s broad white top dominating the sky high above on the southern edge. Naturally, with abundant potatoes, a distillery was first on the scene. 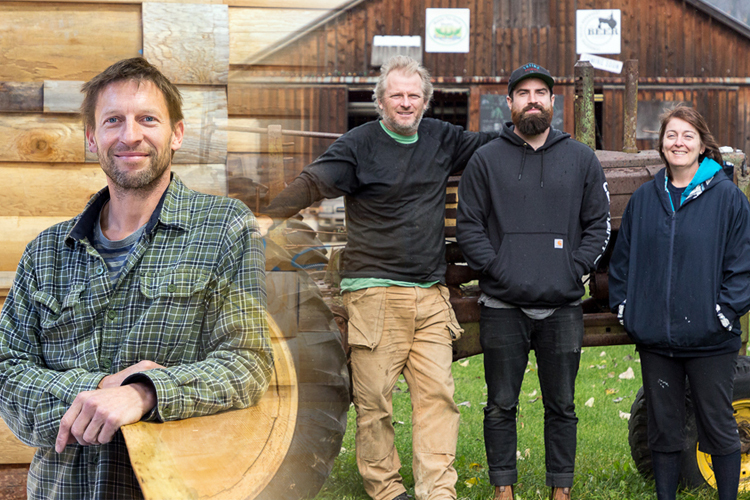 As the only distillery between Vancouver and the interior, Pemberton Distillery has done very well with the production of a multitude of organic spirits. 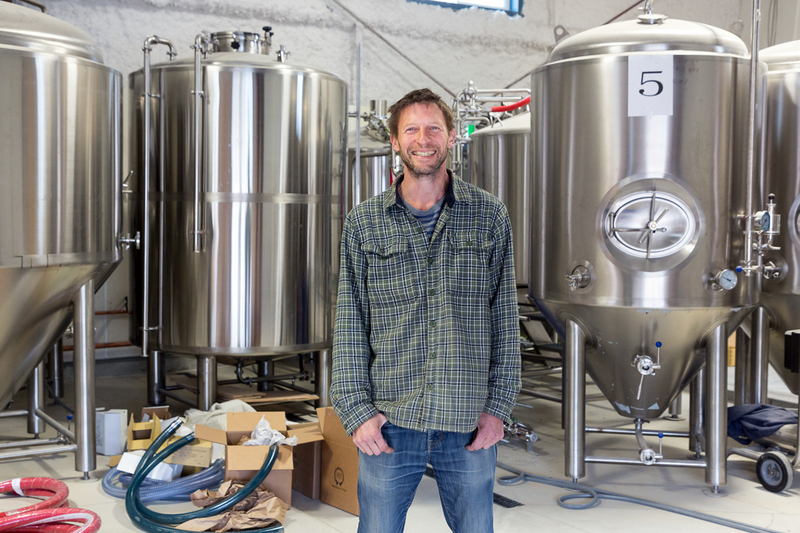 Just down the road in the same industrial park is the next in line of craft – Back 40 Brewing. With tanks installed and the tap room almost complete, Back 40 hopes to be pouring the first craft beer in the Pemberton Valley by sometime in December. Not far behind is Pemberton Valley BeerWorks. From the Pemberton junction it is 12 km of prairie flat driving heading west up the valley. PVBW is a true first in the craft beer industry. Onsite of one of the largest potato farms in the valley and 120+ years of family farming – the Millers are ready to add another chapter of history to their family. With the ability to grow their own barley and hops and spring water in abundance on their farm, they are set to become the first farm brewery that is able to supply all their own ingredients. In other words – totally sustainable. Plans are to have an AirB&B on the farm and regular live music entertainment. There is rumours of a large brewery with its own malting facility and 100 acres of hops further down the valley. Back 40 is an Agricultural term that refers to the back piece of large farmland – unused, a little wild and off the radar. The brewery is in it final stages of construction and is planning to open sometime before the end of the year. When the doors open, brewer Jeff MacDonald plans to showcase a variety of beers – IPA, pale ale, lighter ale and stout and then expand that to seasonals, fruit beers and other varieties sourced from the valley. Jeff hopes that more of the basic ingredients will become available in the valley as the beer scene grows. A farm at the western end of the valley has planted 100 acres of hops – but it will be 3 or 4 years till they can be harvested. For the time being some of the hops will be sourced from HOOH Hops Inc in Lillooet. The brewery has an open display with a 10 hectoliter system, with plans to produce 1500 to 2000 hectolitres a year. 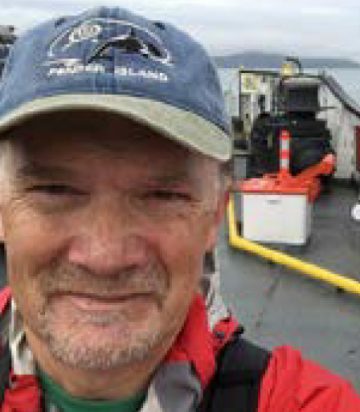 With a growing industrial park he expects a fair number of the folks that work in the area on a day-to-day basis coming in as well as the Pemberton community that live nearby. In the summer months the 99 highway is typically quite a busy thoroughfare with people going up to the Duffey Lake area for recreation or further into the interior on road trips. I asked Jeff about the reclaimed wood in tasting area. He states “the walls are from a from the local log home mill and we found some old barn wood on a farm property nearby.” The reclaimed weathered wood give a wonderful warm feeling to the interior of the brewhouse. He continues “we will be filling growlers as well as offering samples and getting a lounge license as quickly as we can. Packaged product will be available in the coming year. 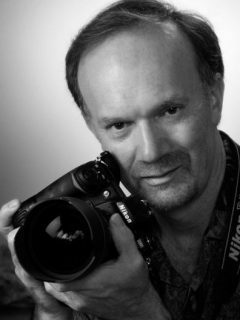 Jeff’s background was in the Whistler hospitality business over the past couple of decades. He has always had a passionate interest in beer. Three years ago he and his partner bought a sophisticated pilot system, started brewing and it turned out to be what they loved doing more than anything else. 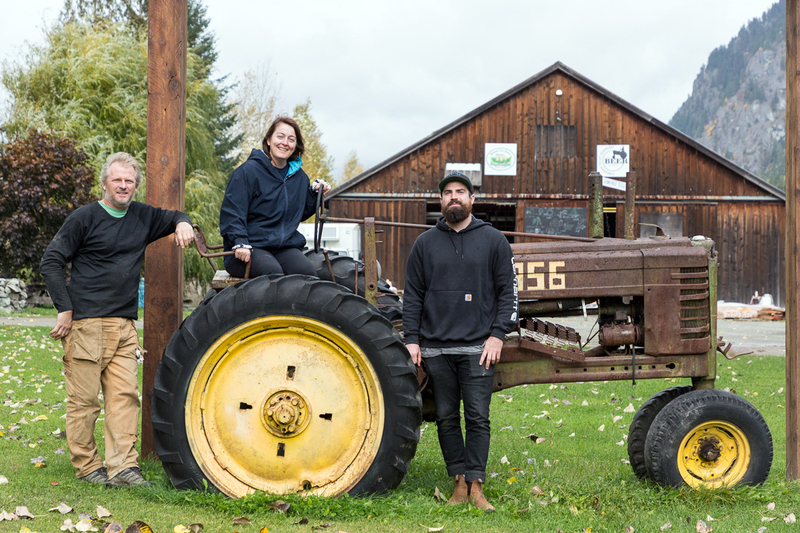 The first organic brewery in the Pemberton Valley is a family affair with Brenda, Bruce and son Will at the helm. The idea for a farm brewery was first pitched to Bruce by Brenda 30 years ago. In the last 3 years Bruce became receptive to the idea and Brenda did an apprenticeship at Coast Mountain Brewing in Function Junction. They both agree that 30 years ago it would had been a dismal failure. Bruce states “It use to be that no one new the name Pemberton, but that has now changed and the timing is perfect for us.” A local annual festival got them to thinking that the time was right. Brenda states “I have been brewing beer for a long time and we have this Slow Food Cycle with 4000 participants that goes through Pemberton ever summer. We thought it would be so cool to sell this beer that is 100% from here during the event. When we set out to participate, we found out that legally we had to be a full brewery – we could not sell out of our garage. It was cost prohibitive to produce beer just for the one event – so it developed into becoming this big brewery. Bruce adds “Instead of being this garage thing, it is pretty well going to be suited to the size of our whole farm. Brenda continues “it is good that it has taken so long because it really has stepped itself up as we have gone along. PVBW plans to open with five beers on tap. Brenda is working on a Wit Beer as number 6. Watch for a chanterelle scotch ale and a potato pale ale. Brenda states “we want to have really good beer – that people will go OMG! When people come to our farm brewery they get to sit and enjoy the view, hear the animals, enjoy life the way we have it – a slowed down pace – where you get to sit down and feel the sun in your face. And we will have a place to stay for people and there are also alot of placings in the neighborhood, if people wanted to come and take in Whistler sites or bike riding in Pemberton or hiking. Or just ride up the road and have a beer at the end of the day and a place to stay – watch the sunset like we get to, and take entirely for granted.” Will adds ” in the past Whistler and Pemberton stood for opposite things – where the Whistler brand is very corporate and Pemberton is authentic and so we like to play into that. People that live in Whistler – they like to support Pemberton stuff because they feel it is more in line with them. Whistler has great breweries but they will never be Whistler’s thing – they will always be eclipsed by skiing/biking and the resort, but for Pemberton if you put a couple of farm breweries in – it strengthens the image to be a craft beer destination. The Miller family is excited to see the changes the craft beer movement will bring to their community and to their 120 year old family farm. 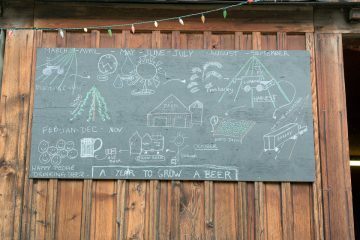 Sharing not only beer, but also the farm life seems to be right up their alley. Brenda concludes “being day to day farmers, it is fun to see your life through brand new eyes. So next summer we are hoping to share that with people. We have always wanted to make this a place we can share and have guest hangout on the farm, see the animals – it puts the magic back in it.” They are excited that there are other breweries in the valley and that this is the time for Pemberton to shine. If you want to witness a page of history in craft beer in BC – be sure to get up to Pemberton as soon as possible. Things are heating up … and it is not the piles of farm manure. It’s bad enough that small independent breweries have to fight against huge multinational corporations and a draconian distribution structure…but it goes against the entire ethos of the independent craft makers movement to straight up steel a breweries name like these people have stolen the Back Forty Beer Co. from Gadsden, AL. They stole their imagery even going so far as to use their actual logos and marketing language. They even made a honey brown ale just like the original Back Forty Beer Co.’s Truck Stop Honey Brown Ale. Back Forty has been in business for 9 years and won a Silver medal at the 2010 GABF (the largest beer festival in North America) so this wasn’t a mistake. It is not proper. It’s just plain not nice. Imagine how the real Back Forty from Gadsden, AL feels. You know that feeling you have right now. The one where you aren’t getting credit for all your hard work? Well yeah, Back Forty worked their butts off for 9 years of ‘blood and sweat’ to build a brand and tell a story and then it is straight up stolen…twice. By you guys and the folks in Saskatchewan. It’s still early. Do the right thing and come up with an original name that is not all ready in use. 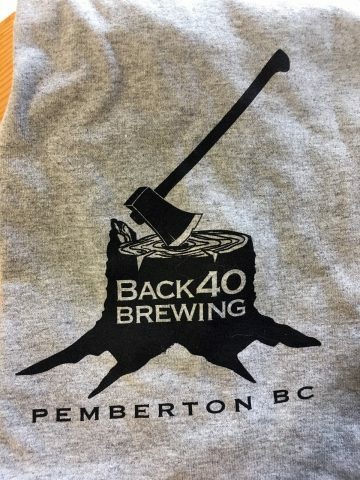 I’ve seen Back Forty beer available here in BC and all across Canada. There is no way you guys didn’t know about them. What a poorly written, shite, article. nor brewed in whistler, nor C- anywhere close to amazing? Whistler Brewering is of course a shadow brewery owned by the Northam Group and brewing in gorgeous … Kamloops. WTF.